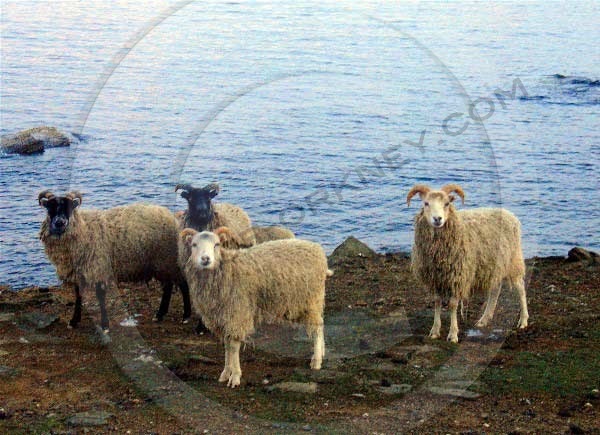 The North Ronaldsay sheep is small sheep belonging to the northern short-tailed group of breeds. Bones of similar animals have been found at Skara Brae dating from the Bronze Age and a recent genotype survey organised by the Rare Breeds Survival Trust, demonstrated that the breed is still virtually unchanged from the original type. These fine boned animals are primitive, having evolved in a specialised seashore environment on their native island but they have adapted well to mainland management including conservation grazing. Confined to the shoreline for the majority of the year to conserve the limited grazing on the island, these sheep feed mainly on seaweed. The colour of the face and legs can vary and the fine wool can be any colour from white through to black. The head is small and the ewe’s face has a “dished” appearance. Rams develop a mane and beard of coarse hair. The tail is short and thin. 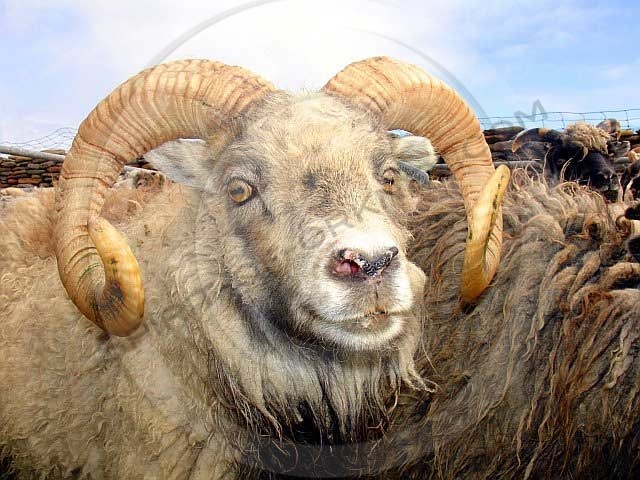 Both rams and ewes can have the distinctive horns which curl around and up, around their face. However, occasionally they curl around backwards, slowly puncturing the sheeps’ skull, so regular trimming is often done to avoid this. The North Ronaldsay ewes which have a strong maternal instinct, lamb easily and frequently produce twins. Maturing slowly and feeding off seaweed gives the meat a distinctive flavour, much prized by chefs. According to the RBST, there are about 3700 sheep still on North Ronaldsay and about 807 over the rest of mainland Britain of which about 554 are adult breeding ewes plus 90 shearlings, putting them them on the endangered list. The different coloured wools, for which they are mainly bred, are popular with hand spinners, felters, knitters and textile designers. In more recent years colonies of the sheep have been established inland and on other islands to prevent the entire breed being wiped out through catastrophe (such as foot and mouth). A small number have also been exported as an exotic breed. It has been found that the sheep’s digestive system can readjust to a non-seaweed-based diet within two generations. The images used on this post have been reproduced with the kind permission of Trevor Thompson, who’s travels took him to a working farm on the Islands of North Ronaldsay. BBC Countryfile – Adam’s farm animals – Adam has a number of North Ronaldsay Sheep on his rare breeds farm. RBST – Rare Breeds Survival Trust.